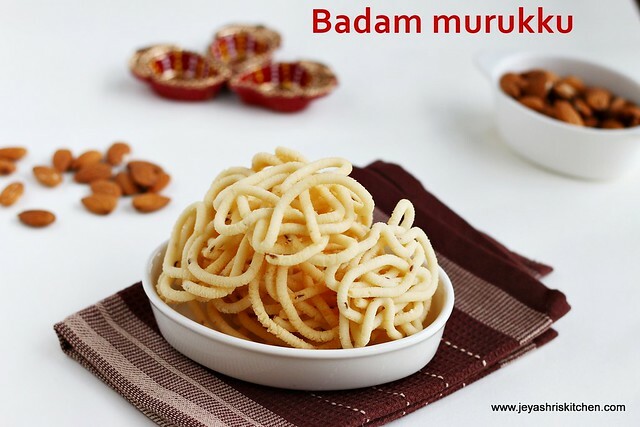 Almond murukku | Badam murukku is an easy diwali snack recipe. 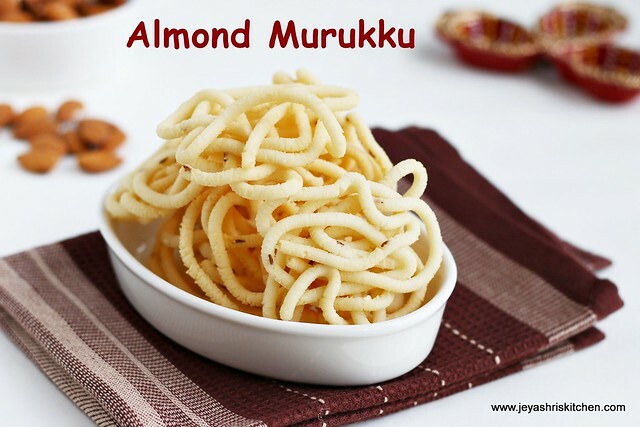 For bachelors who live in abroad and don't have access to urad dal flour or pottukadalai, this murukku you can make only with rice flour and almonds. I wanted to try cashew murukku, which i learnt from my friend's mil 2 years back. When i saw this almond murukku here , i thought i will give it a try. The murukku turned out very crispy and i loved the flavour of almond in the murukku. 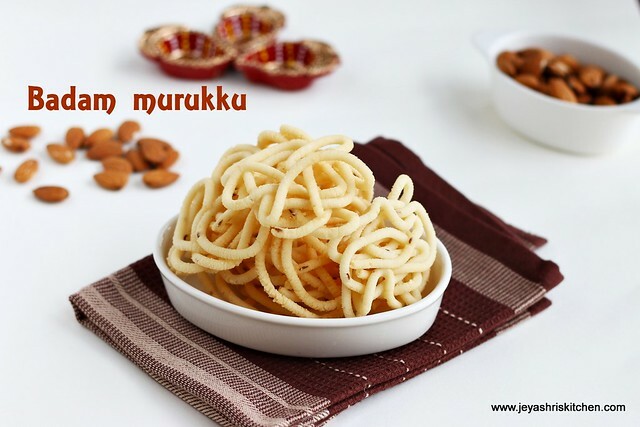 You can try this murukku with store bought rice flour too. Even idiyappam maavu works out well for this recipe. Check out my other diwali recipe collections too. Follow jeyashris kitchen on facebook for updates. Soak the almonds in hot water for 15 minutes. Take out the skin after 15 minutes. Grind this into a smooth paste using little water. In a wide bowl add the rice flour, almond paste, sesame seeds, jeera and salt. Add butter and 1 tsp of hot oil to this and knead well into a soft dough, using little water. I used the thenkuzhal achu for this murukku. Keep the dough covered all the time. Take a portion of the dough and put it into the murukku press. Heat the oil for deep frying. Once it is hot, slow down the flame and squeeze the murukku directly to the hot oil. Alternatively you can squeeze it on the back of a greased ladle and transfer it to the oil. Cook on both sides and once the oil sound subsides take it out from the oil and drain the excess oil in the kitchen towel. Repeat this for the rest of the dough. Store the murukku in airtight containers. If needed you can add 2 tblsp of pottukadalai powder or urad dal powder to the murukku. It is optional, the murukku will be very crisp and flavourful without that too. Addition of hot oil in murukku will give crispiness to the murukku. So don't skip it. Alternatively cashew nuts can also be added instead of badam. I have tried both version and both turned out very nice. If the dough is very thick it will difficult for you to press. Also if it is too loose he murukku will break in the oil. So ensure it should be soft. The almond paste is to be added to rice flour to make the dough? I don't think it is mentioned.